When I wrote my first Christian pirate series (yes, you heard me right! ), I knew nothing about the culture or history of the 17th century Caribbean. Of course writing any novel requires a great deal of research, but writing historical novels involves so much more than just researching the facts about a specific locale. Much of writing a good book is getting the “feel” for the location and time in which your story takes place. But how can you do that when it happened nearly 400 years ago? How can you transport your reader to an era that you’ve never experienced yourself? But the truth is, you can experience it in a sort of virtual way by surrounding yourself with things that affect each one of your senses. First, however, you must do your research. I devoured every book I could find on the history of the Caribbean and the history of pirates. I searched through libraries, local and online. I used Google books to look for out of print books on the topic and/or any original documents I could find. Original documents such as newspaper articles and diaries are great sources of the mindset, language, and culture of the era in which you write. Secondly, I read great fiction either written in the time period or written for the time period. Fiction written in the time period is best because it gives you a feel for the language and phrases used at the time. I highly recommend reading fiction set in your time period during the entire writing of your book. That way you will be fully immersed in the language and culture. For me, I read Raphael Sabatini’s Captain Blood—the best and most well written fiction set during the era in which I was writing. Thirdly, if possible, travel to the spot where your story takes place. Everything else will have changed, but you’ll still be able to get a feel for the weather and the flora and fauna. And visiting local museums is a must! For me, I grew up in South Florida so I was already familiar with tropical climates. For my series set in Charles Towne, I spent a week in Charleston, South Carolina, tasting the food and visiting old homes and museums. Fourthly, prepare and eat food from the time period. This can be quite fun and interesting and will give you a way to describe the tastes and smells of local food in your book. Can anyone say grog? Next, when you begin to write, surround yourself with as many things from the era that you can: pictures, historic replicas, maps etc... For me, I own a replica of a 17th century sword and a 17th century flintlock pistol. I also had lots of pictures of the Caribbean around me, including an old map I bought off the internet. I had a stuffed parrot (Morgan) sitting atop my computer screen for inspiration. 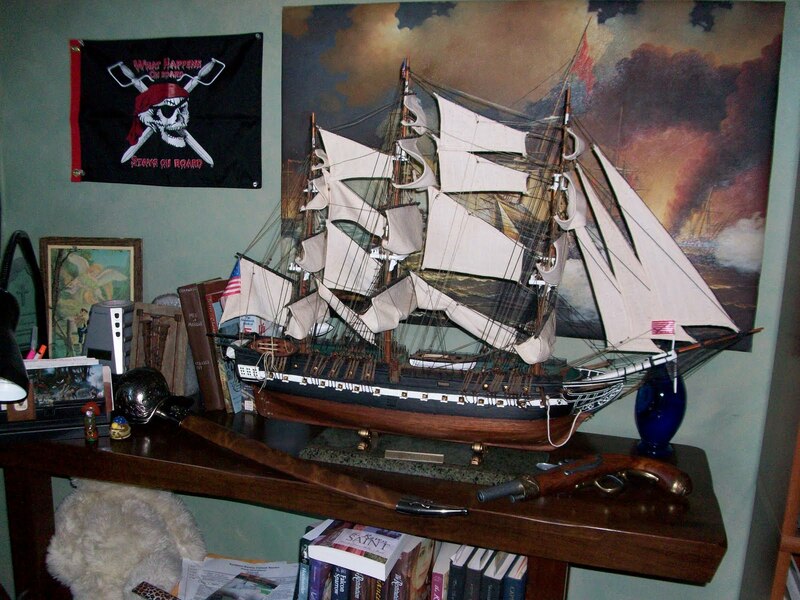 In the picture, you can see my sword and pistol, my exact replica of the USS Constitution, my pirate flag, painting, and other things. So far, we’ve touched on the senses of sight, taste, touch (replicas). Now all you need to do to complete the experience is add hearing and smelling. To recreate the sounds in my book, I played a DVD of sounds of the sea as well as the soundtrack from the Pirates of the Caribbean movies while I wrote. But you could use any music from the era or from a movie set during your time period. When I was writing a battle scene, I put on sounds of cannons firing. When I wrote a storm scene, I put on sounds of lightning and thunder. I also placed sea-scented candles around me and filled my writing room with ocean smells. These days there are candles for just about any scent you want. Although I, for one, would love to travel back to those adventurous pirate days to do my research, immersing myself in the era through intense research and then surrounding myself with things which affect each one of my senses is the next best thing to being there! Wow, very interesting! I have Surrender the Heart coming up and I can't wait!